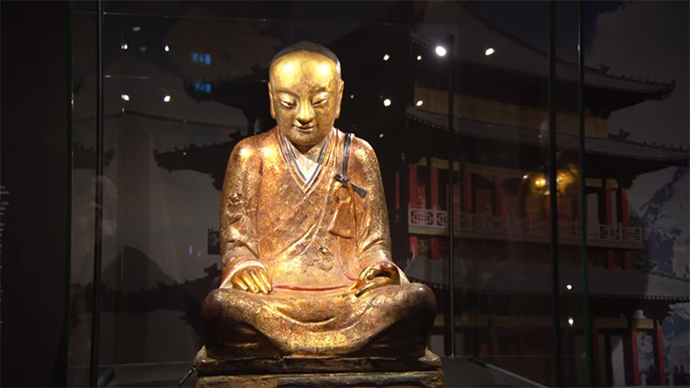 Dutch scientists have scanned a statue of Buddha, dating back to the 11th or 12th century, to reveal a mummy inside. They’ve also taken samples of the mummy’s insides and discovered scraps of paper with ancient Chinese characters on them. A human skeleton glows through the statue’s silhouette on the computed tomography scan, done in the Meander Medical Center in Amersfoort, the Netherlands. Gastrointestinal and liver doctor Reinoud Vermeijden and radiologist Ben Heggelman examined their “oldest patient ever” in their free time, the center’s website says. The mummy is identified as the mummified body of the Buddhist master Liuquan. It’s described as being one of a kind and consequently the only one available for research in the West. The doctors performed endoscopy on the mummy and say their discovery is unique. They found scraps of paper with ancient Chinese characters among rotted material in places where organs used to be. Bone material from the mummy has been taken for DNA testing. The results will be revealed in a monograph on Master Liuquan, to be published later. The statue containing the mummy was taken for medical tests, from the Drent Museum in Assen, where it had been on display. It has since been brought to the National Museum of Natural History in Budapest, where it will stay till May 2015.